Take a fascinating and informative battlesite tour, led by Michael Grams in conjunction with Carlton Joyce, noted military historian and author of the Stand Where They Fought trilogy. We can offer your party private tours from Bayeux or Caen for Normandy Tours, Metz, Luxemburg City or Ettelbruck for Battle of the Bulge Tours, Verdun, Rheims, Toul, St.Mihiel or for North-Eastern France Tours. To be used in conjunction with the book “Stand Where They Fought” Available to order, in three versions, on this website. 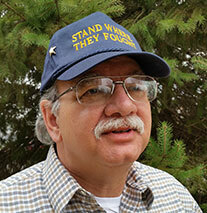 Specializing in BOTH World Wars and culture of France, Michael Grams is a Historical public lecturer at home and abroad. Carlton Joyce, a retired application spectroscopist and executive spent innumerable note taking hours with participants of the battle for Normandy. Stimulated and supported by General Eisenhower, Carlton researched hand written post battle reports in numerous military archives. 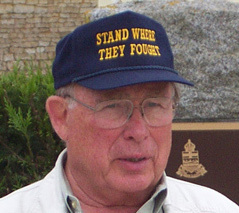 Since publishing “Stand Where They Fought”, 150 battle sites in Normandy, in 2000 he has conducted 50 battlefield tours throughout Europe and the Mediterranean. To accommodate travelers using frequent flyer miles or desiring an extended stay, the tour prices exclude airfare; tours originate and end at French or Luxembourger Hotels. Born in Verdun, France, at the US Army base in Thierville. Raised in St. Mihiel and Metz, while attending French schools. Michael has strong family ties in France. An American Citizen with extensive firsthand knowledge of the battlefields and terrain of Northern France, including Alsace. With very strong historical knowledge in both World Wars. Very knowledgeable in French food, wine and culture. He is the representative of both the National Association of the Salient of St. Mihiel the Village of St.Mihiel in the United States. Michael is very well traveled throughout all of France. Residing in America since1972, he has retired from the Wine industry after Sixteen years. and is currently the Director of the Volo Military Museum in Volo, IL. This is my third tour with Carlton Joyce, owner and leader of Normandy Tours. He is an extremely knowledgeable historian and Tour leader. This tour was quite a mixture of subjects. Included Napoleon at the battle of Waterloo,( which I really didn’t know much about), The Battle of the Bulge in WWII and then numerous WWI battle sites, again, an area I really hadn’t concentrated on, in the past. A HUGE thank you to Carlton Joyce, our tour leader and his very able Executive Assistant, Nancy Hoskins for making this a terrific tour. Now, we have to talk Carlton out of retiring so we can enjoy his company, again, on a future tour. One week later and my head is still swimming from the fabulous tour of Normandy you conducted for the Georgia Historical Society. We were all impressed by your knowledge of the events and terrain, your presentation skills, and most of all your equanimity in the face of occasional grumbling from a very few whose enthusiasm tended to lag at times. Everyone even those few had a lot of fun and we have you to thank for it. The trip was all I had hoped it would be. It was a pleasure to spend the time with you and I look forward to doing it again soon. In March, I accompanied a group of 23 Hamilton College students (who were enrolled in my course on World War II) to Paris, where we were met by Carlton Joyce, of Normandy Battlefield Tours, who had put together for us a tour of D-Day and the Battle of the Bulge sites in Normandy and Belgium. After our ten days together, I had decided (and my students agreed) that Carlton was the ideal guide to take us to these sites. Carlton proved himself a master of tour logistics, with an encyclopedic knowledge of the battlesites we visited, and an engaging manner that made him a pleasure to travel with. We visited all the major American, British, and Canadian sites such as Utah and Omaha Beaches, Ste Mere Eglise, the American military cemetery, Pointe du Hoc, etc. Carlton surprised and delighted us with a series of off-the-beaten track and incredibly interesting side-trips. In Normandy, at la Fiere causeway, scene of a significant 82nd Airborne 3rd-day battle, Mr. Poisson, a local French farmer, gave us a tour of his land and dozen buildings showing us German machine gun nests and bullets embedded in the stone walls. His collection of helmets, weapons, and assorted militaria relics found in the buildings, hedgerows, and fields filled his basement. The two hundred plasma bottles conjured the casualty scenes in the home and courtyard. In Belgium, we drove to a hillside overlooking the village of Foy, outside of Bastogne, and in an overgrown wood lot, found the foxholes dug by American paratroopers during the Battle of the Bulge – the very site depicted in on of the episodes of “Band of Brothers”. All of this made the war come alive for the students, in the kind of leap of historical imagination that’s very difficult to obtain from textbooks and documentary films alone. I highly recommend Normandy Battlefield Tours for any history class or alumni group thinking of touring European battle sites. A guide to travelers planning a Normandy trip and a stimulus to those who have not planned to visit our heritage.